LOS ANGELES – The conversion of 12,500 acres of open space on the edge of Los Angeles County into a 19,000-home community was approved by the county’s Regional Planning Commission Wednesday over the objections of environmentalists and others who called the project out of step with modern approaches to urban development. The long-planned Centennial project is being proposed for a 270,000-acre plot in the Antelope Valley billed as the largest continuous piece of private property in California. The land is owned by the Tejon Ranch Co. The project would include not only housing, but also 10 million square feet of commercial space, schools, fire stations, a police station and a library, all at what Tejon Ranch says will be no cost to county taxpayers. 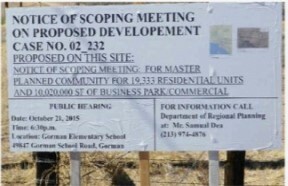 Before approving the project, the commission heard more than two hours of public comment, with many speakers expressing concern about the environmental impact on the open space, while others said the idea of a master-planned community of such magnitude was a relic from the past — despite the housing shortage in the county. “L.A. could be an innovative leader in urban planning that protects our wildlife spaces, while also reducing tailpipe and traffic emissions and prioritizing transit-accessible affordable housing in places where people already work,” said Ash Lauth of the Center for Biological Diversity, echoing many of the concerns expressed at the meeting. The Center for Biological Diversity has argued the project would destroy grasslands and habitat for rare plants and animals, contribute to air pollution by generating more than 75,000 new vehicle trips a day as drivers commute into Los Angeles and present a safety risk to its residents because it is located in what the county considers a fire hazard zone. The Los Angeles County Board of Supervisors is now set to consider the project, which would take 20 years to fully construct. The Tejon Ranch Company has presented the project as an economic win for the county, predicting it will create 19,000 permanent jobs, 25,000 construction jobs and a $31 million annual public revenue surplus for the county. The project has also been pitched as an environmentally friendly “sustainable” community that will conserve water and energy. The project developers have committed 10 percent of the units to be affordable, although the exact mix of low- and moderate-income has not been finalized. The commission recommended that it be raised to 15 percent, along with consideration that a certain amount also be set aside for supportive housing for the homeless. Responding to the concerns over air pollution, Tejon Ranch officials said the project has measures that will promote electric vehicles and complies with per-capita greenhouse gas emissions for the state’s 2030 and 2050 targets. Representatives of the company also said the reason the area is considered a fire hazard zone is because there are no fire stations there, but the creation of fire stations would change the designation and concern. Some representatives of business organizations expressed support for the project. A lawyer with the Center for Biological Diversity said the organization hopes the Board of Supervisors will stop the project. “We’re hopeful that the L.A. County Board of Supervisors will reject the commission’s recommendation. The county should focus development in existing cities instead of approving sprawl dozens of miles away from jobs,” attorney J.P. Rose said. 17 comments for "Possible development of ‘Centennial’ city in L.A. County moves forward"
I seem to recall a housing crisis a while back with thousands of unsold new and foreclosed homes. Now it’s reversed??? Oh, well. Carry on, ye of short memories. There’s got to be a smarter way. I haven’t checked in a few years but I remember looking at home rentals in the Antelope Valley that read something like this. Quartz Hill. New 5 bedroom, 3 bath home w/pool. $1,700/mo. Section 8 OK. This is why Highway 138 going west (Avenue D) is about to become a 4-lane freeway from the 14 to the 5. This will be a really nice community to have in the Antelope Valley. It will technically be in the West Lancaster zip code (93536) along with Neenach and Four Points. 138 a freeway? Why? Why would people in this community be interested in driving 30 miles to get to Lancaster? They can go thirty miles south on the five and be in the valley, or go thirty miles north on the five and be in Bakersfield. You think they will be thronging to the shopping mecca of The BLVD? Pull up “the Signal/Santa Clarita Valley, May 24, 2018; Planners discuss building roads and highways for 19,000 homes near Gorman.” A clearer explanation. Where being built? Cross streets? Well, putting in streets is part of developing a new community, so there currently aren’t any cross streets. If you take the 138 out to Interstate 5, they are talking about an area between 138 and the county line (on your right) and fairly close to the interstate. The most obvious impact on current AV residents is that there would be an additional 10,000 cars coming down the five to crush through the Newhall Pass in the mornings. It’s only projected at 19,000 units. How many of them do you figure will be going to Vegas at any one time? They will be going to work, most of them at about the same time, and a lot of them through the already bizarre Newhall Pass. When I told a friend from the east coast that the Newhall Pass is fourteen lanes each way he couldn’t even begin to wrap his head around it. Tim Scott. They should have had all 28 lanes of the Newhall pass going 1 way….north. It’s likely that Lancaster and Palmdale will also have a housing boom sometime during the 20 building phase of the new project. Egads!! I still can’t get over what must be a million condos on the east side of the 14 in Santa Clarita which will likely continue to grow as well. Then, there are those who still don’t want the High Speed Rail built in California because…..Benghazi or something. They are planning on widening it. Read my comment about where to look, to find out what is being proposed. Foothills of Sierra Pelona and Tehachapi Mountains. Far northwestern Antelope Valley. North of highway 138, east of Interstate five, south of the Kern county line. I don’t know where the eastern boundary would be, but it won’t stretch all that far from I-5. Narrowing it down a bit. 300th street west and Hwy 138 (C-6). Where are they going to get water from? Same water, but only the wealthy would be able to afford it, the poor will get if for free and everyone else will suffer. As an agricultural user, Tejon Ranch has first dibs on water rights and gets their water at a ridiculously subsidized rate. Selling off a substantial chunk of their land might actually free up more water than the project consumes. I haven’t seen any numbers, but with the “ag first” water distribution plan that California is stuck with it is possible for it to work out that way.